William is a Research Assistant with the Marine Ecology Group. He assists in various field work activities (e.g., recording the occurrence of marine megafauna from ship-based and aerial surveys) while also utilising skills in GIS to produce map products for stakeholder reports and papers. 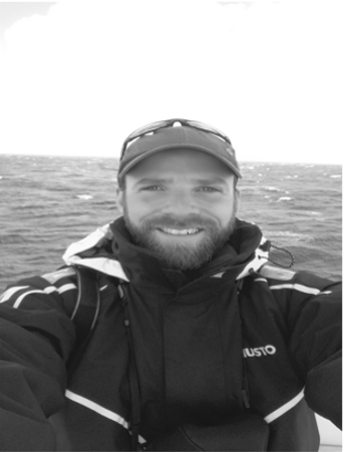 William has a wealth of experience of working at sea, particularly in data collection. Since 2006, he has collected fisheries dependent data from fishing vessels operating in Irish, Mediterranean, and New Zealand waters, and has crossed the Atlantic twice while recording the occurrence of marine megafauna from research vessels. He began working with MaREI as a Research Support Officer in 2015, initially on an SFI-KOSMOS funded project to better understand the distribution of cetaceans in Irish offshore waters. He was then seconded on to the Irish Government funded ObSERVE-aerial project, where he participated as an observer during survey flights. In addition, he assisted with completing aerial surveys for marine mammals and seabirds as part of the WESTWAVE project, as well as mapping the seasonal occurrence of marine megafauna recorded during those surveys. After leaving MaREI in 2017, he worked with the Museu da Baleia da Madeira, Portugal and as a Research Assistant with the School of BEES, UCC, before returning to MaREI in 2018. William is a graduate of the National University of Ireland, Galway, with a BSc (Hons.) in Marine Science achieved in 2008. He then graduated with an MSc in the Marine Environment and Resources in 2012, offered an accredited jointly by the University of Southampton, Université de Bordeaux 1, and Universidad del País Vasco/Euskal Herriko Unibertsitatea. He followed this up with a postgraduate certificate in GIS from the University of Ulster, conferred in 2016.